There’s a beautiful paper by Daniel Read and two coauthors showing the gap between what people want to do in principle and what they want to do right now. They asked subjects to choose several films from a list containing a mix of highbrow titles (e.g., Schindler’s List) and lowbrow titles (e.g., My Cousin Vinny). When asked which film they wanted to watch a few days later, most picked a highbrow one. But when asked which they wanted to watch right now, most went lowbrow. In principle, we want to be the kind of people who watch serious movies, maybe even French ones—just not tonight! And so our queue becomes aspirational, filled with titles that are more ambitious than the ones we really want to watch. Now that Netflix offers streaming, I’ve dropped the DVDs altogether. With streaming, we no longer get stuck with movies we only want to watch in theory. Instead, we feel like we’re paying for the right to watch any movie at any time—even if we don’t wind up watching many. I started to wonder if the same thing may happen with game rental services like GameFly. Are you likely to add avant-garde games like No More Heroes to your queue1 with intentions of experiencing something unique yet move yet another military themed shooter to the top of the list? Would you consider adding a Japanese RPG for the sake of branching out into genres you haven’t traditionally played but groan in disappointment when it actually arrives int he mail? Oh yay, the Citizen Kane of video games has arrived in my mailbox. How did that thing get in my queue, anyway? I bet so, and the question might get more complicated if games-on-demand products like OnLive ever take off. 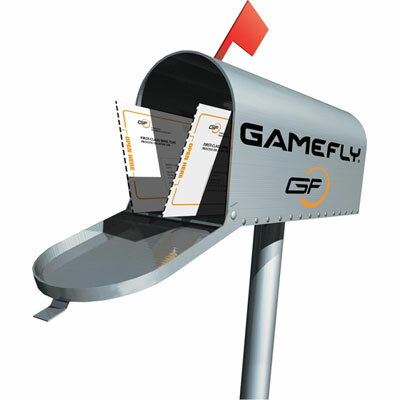 Imagine if GameFly offered a streaming service where you could stream games or download rental copies. Would you think it’s a better value because it lets you avoid having to face up to your aspirational games when they arrive in the mail? 1. Or should I say “Game Flap?” HI WEEKEND CONFIRMED GUYS! another good bit about… what? Don’t leave us hanging bro. The instant gratification from playing a sports title, RTS, FPS shooter or any other game with limited/timed sessions seems like a better reward than investing the time to start a complex RPG. (Although once you are over the initial barrier of starting the RPG it’s another story). When you list the best-selling games of today, almost all of them combine the best of both worlds – persistence and instant gratification. Whoops, that bit wasn’t supposed to be there. NEVER MIND. On the other hand I can’t really imagine having the same effects with highbrow games as with highbrow movies or, better yet, books (yet), as social status of gamers is not that widely accepted of being highbrow as is – in case of Authors – Hemmingway (never having read that myself). After all, quoting something from Hermann Hesse or Sidharta Gauthama amongst gamers will reward you with as many ‘wtf?’-faces as will quoting Duke Nukem in almost every other community. Hi again, Jamie. I haven’t stopped by your blog in a while (the new tab groups in Firefox make it much easier for me to justify keeping a ton of pages open, though). I think this is an interesting area of motivation and goal-setting research. Though leisure psychology is what I consider my primary interest, most of my paid work is in health psychology. You can actually see a lot of this behavior with people who buy fresh fruits and vegetables! They buy them with all the good intentions of improving their personal nutrition, but at every meal they favor something more tasty or convenient, until their fresh produce has rotted! In this case it’d be interesting to explore how that “aspiration procrastination” affects long-term behaviors. Do individuals learn that buying produce is a waste of money for them and then stop doing it? Or do they learn to eat their produce so as not to waste it? And in the likely event that it varies from person to person, what separates the two groups? Of course, it would be interesting to examine the same concept with video games 😉 In fact, feel free to contact me sometime if you’d ever like to collaborate on a project like that (edujeremy@gmail.com). The difference between Gamefly and Netflix is that netflix has more DVDs than gamefly has games. You’re far more likely to get something from the top of your netflix list than you are your gamefly list. This has proven to be a blessing in disguise for me. I just put games I’m interested in playing on my gamefly queue and get them in random order. This prevents me from picking out the easy choices for me. When I get it in the mail, it’s a surprise and I approach it as a new experience.